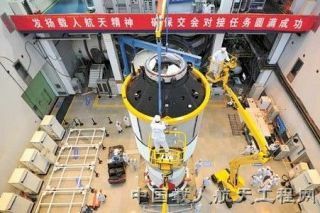 Work is underway in readying China's thrust into a space station era with Tiangong-1, the first Chinese space station module.. The banner above the hardware reads: "Carry on the spirit of human spaceflight, insure the complete success of the docking mission." WASHINGTON — The United States and Europe face barriers to effectively engage with China on space policy matters, but recent changes within the Chinese government and industry present an opportunity for dialogue and possible technical cooperation, a panel of experts agreed July 28. Among Washington space policy circles it is often said the motives behind Chinese space policies and actions are, at best, not transparent and, at worst, nefarious. These sentiments are in many cases inaccurate and reflective of a failure to communicate between both sides, three academic and policy experts said at an event here hosted by the Secure World Foundation. The Secure World Foundation and Chinese Academy of Sciences in May held a conference in Beijing to discuss Asian space policies within the context of the larger multilateral environment that included government and industry officials from China, India and Japan. A wide variety of technical and policy issues were discussed, and it was clear there is an increasing willingness among these nations to engage with the United States and Europe on space policies and processes, said Ben Baseley-Walker, an adviser on security policy and international law at the Secure World Foundation. China differs from the United States in that it does not have a well established community of space policy thinkers that convenes in public forums or shares its views abroad, he said. But this community is now growing in China, and international engagement is critical. "One of the things that we found is these communities, as they start to come together, are not internationally connected," Baseley-Walker said. "Connecting them with major space policy actors in Europe and in the United States we saw as one of the key next steps in creating a potential policy check on policymakers and diplomats in the space arena." An area where China can cooperate with the United States and Europe is in space science. Cooperative space development programs can be a key tool for moving forward these bilateral relationships, he said. The biggest challenge to improving space policy dialogue with China is the fact that so many things are changing so rapidly there, said Alanna Krolikowski, a doctoral candidate at the University of Toronto who was a visiting scholar at George Washington University's Space Policy Institute here. While publicly available information on Chinese space programs has historically been extremely scarce, in the past three years that situation has dramatically improved. Now there are a wealth of technical journals, trade publications and official speeches and documents, and Chinese participation in international forums has increased greatly. The challenge is in sorting through that information and determining which sources are credible, a task that is made more difficult by the language barrier, Krolikowski said. The Chinese government, military and commercial space sectors are all undergoing rapid institutional and organizational change, she said. The government in 2008 effectively demoted the Chinese National Space Agency, which had been in charge of representing China's space program to the outside world. Relationships and responsibilities among the nation's different military organizations continue to change. And since the early 1990s Chinese defense firms have evolved from essentially being government ministries to organizations that operate much like U.S. and European defense contractors, she said. "All of these changes introduce a kind of paralysis that really hinders cooperation," Krolikowski said. "People are reluctant to express themselves … because they don't know what will be true two weeks from now or who will be in charge. At the institutional level there's also a reluctance to come out with any statements or official documents because everything is changing. "China is also due for a new space policy probably because a lot has changed since the last one in 2006. China is also in the process of working a new comprehensive national space law through its legislative process. So that will also clarify a few roles and responsibilities within the sector." Historically, Chinese space professionals were focused on either the technical side or the policy side, and rarely both, she said. There is an emerging cadre of Chinese who bridge those two worlds to bring technical advice to policymakers, but these people do not have much exposure to international ideas and perspectives. China is entering a period in which the demand for this particular expertise is likely to grow as major space policy decisions are on the horizon, such as whether to go to the Moon and whether to do it alone, Krolikowski said. "There's a unique opportunity to try and engage the community of space policy professionals," she said. A large discrepancy often exists between American and Chinese explanations for Chinese actions, said Jeffrey Lewis, director of the East Asia nonproliferation program at the Monterrey Institute of International Studies. "We have this problem that is not transparency, it's that it's very hard to find the right community to talk to," Lewis said. "I think all of us who go to China and try to set these dialogues up, we really struggle to get past the usual suspects, the people we see at every meeting. "We really do have this important challenge of finding a way to get at people who actually have something to say. And there aren't that many in China." While a joint space development program may be a bridge too far, the United States and China should start by cooperating on decision making exercises such as military joint threat assessments and glossaries, Lewis said.